And the season has started, all the pumpkin, decorations, turkey and the fabulous smells from the kitchen, yes, this is the season to be creative and cook delicious recipes everyday. This is the reason why the #TwelveLoaves group have made just for you pumpkin inspired recipes. For every hour of the day, so you can make and enjoy with the family. I made for you a spice pumpkin bread, filled with spiced, pumpkin and I add a crunch with some pecans, it is great for breakfast, because is not super sweet and healthy made with organic sugar, flour, butter and eggs. Yes you can actually enjoy healthy delicious food at home. Sift together flour, cinnamon, ginger, clove, salt and baking powder, set aside. In the bowl of a stand mixer, cream sugar and butter for 5 minutes, add the eggs one by one, add the pumpkin pure, vanilla extract, add the flour in 3 additions and the buttermilk in 2 additions, you know, start with flour and end with flour. Add the pecans at the end by hand. Pour the batter in 2 loaves pans, previously grease and bake for 45 minutes or until the center of the bread is completely cook. Once ready, let it cool for 10 minutes and transfer to a cooling rack. Let it cool completely before cutting or eating. Our host this month is Renee from Kudos Kitchen by Renee, and our theme is Pumpkin. For more bread recipes, visit the #TwelveLoaves Pinterest board, or check out last month’s tempting selection of #TwelveLoaves Apple Breads! 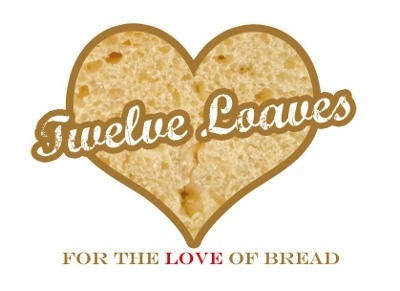 Post your Twelve Loaves bread on your blog, making sure to mention the Twelve Loaves challenge in your blog post (this helps us to get more members as well as share everyone’s posts). This entry was posted in #TwelveLoaves and tagged breakfast, easy, pumpkin, spices by Kathia Rodriguez. Bookmark the permalink.